My boyfriend doesn’t eat vegetables. I say this in all seriousness. He’s a relatively healthy guy, mind you, though his diet isn’t what you would call diversified. His ideal meal: chicken, mashed potatoes or pasta or white rice, some kind of sauce that is orange or tan, and bread. Soft white. Creamy yellow. Simple, straightforward textures. I, on the other hand am all about the crunchy greens, the crackly browns, and the color. As much color as possible. I do most of the cooking (ok, all of the cooking) around these parts, and he is normally a very good sport about the ways I try to sneak vegetables into every meal. The truth is, though, that left to his own devices he would be more satisfied with a nice big plate of Trader Joe’s frozen Channa Masala than tasting my experimental warm bacon spinach salad (I mean it had bacon on it, and he still was wary!). It is certainly up there, though the accompaniments certainly help. (See this post for a full photographic exposé on my loveliest dinner party yet.) This delicious, savory stew is even better topped with feta, basil, capers, and lemon. It is hearty, filling, and healthy. It will take you an hour or so to get it in the oven, but please trust me when I say that the flavor and texture of the finished product makes your effort well worth it. Sauteing all the vegetables separately first and then baking them slowly together in the oven deepens their flavors and produces a perfectly textured dish. I think I’ve mentioned before that I find slicing vegetables meditative and relaxing. Here is your chance to see what I mean. You will singlehandedly prepare no less than six separate vegetables (no small task) and reap the benefits tenfold. This dish is delicious hot out of the oven and only gets better as it cools. Wait till you have it for lunch the next day. Serve it over pasta or rice. Ladle it over buckwheat crepes or into a baguette. Roasted veggie salad? How about an omelette? How about you make this and tell me how you enjoy it? I’d love to hear your feedback. Note: The step of salting, draining, and drying the eggplant is a vital one–otherwise it will completely lose its structure and melt into the dish. Also, it helps keep the workspace neat (for this recipe especially, but often for others as well) if you have a big bowl for seeds and stems on the counter so you don’t have to keep carrying your board to the trash can or compost. 1. Set your water to boil. Slice the eggplant into rounds about ½” thick, then cut the strips into pieces about 2 inches long. Place the pieces in your colander, salt lightly all over, and set aside to drain for 30 minutes. 2. Halve the peppers lengthwise, remove the seeds and veins, and cut them into strips about ½” wide and 1½” long. Chop the onion into ½” squares. Submerge the tomatoes in boiling water for 10 seconds, remove the skins, halve them crosswise, and gently press out the seeds. Chop the flesh into large pieces. Quarter the zucchini lengthwise and cut it into pieces 1 inch or so long. Finely mince the garlic. Preheat the oven to 350°F. 3. Heat about 2 tablespoons of olive oil in your large skillet and add the onions, garlic, and dried herbs. Saute over medium heat for several minutes. Salt lightly, add the tomatoes, and turn down the heat to medium. 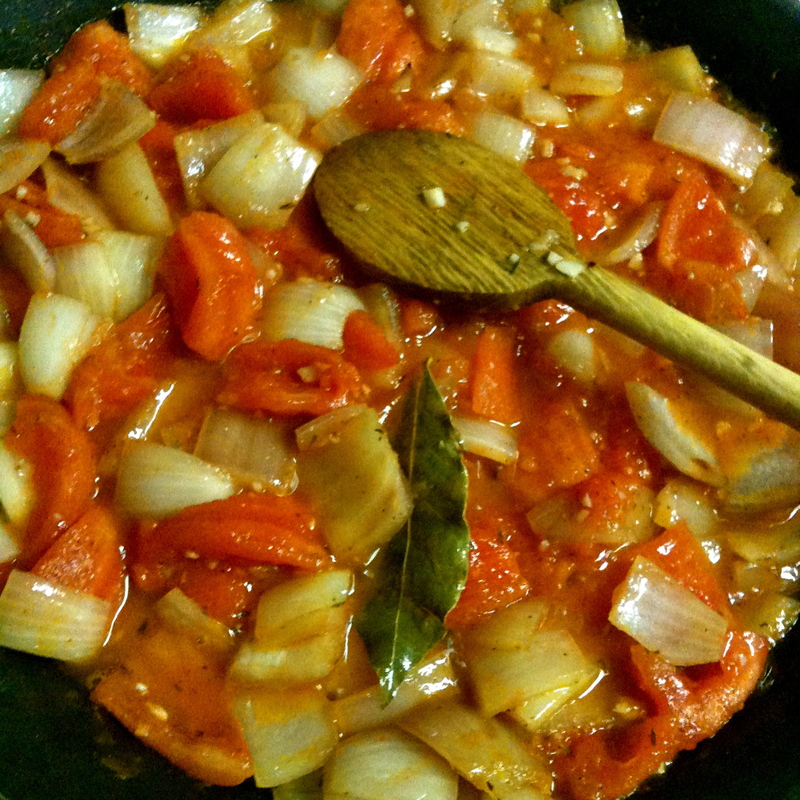 Cook for about 7 minutes until the juices of the tomatoes have evaporated and you have a thick sauce. Season with pepper and pour into your baking dish. 4. Add another tablespoon of olive oil to the pan and, when it is hot, add the zucchini and salt lightly. 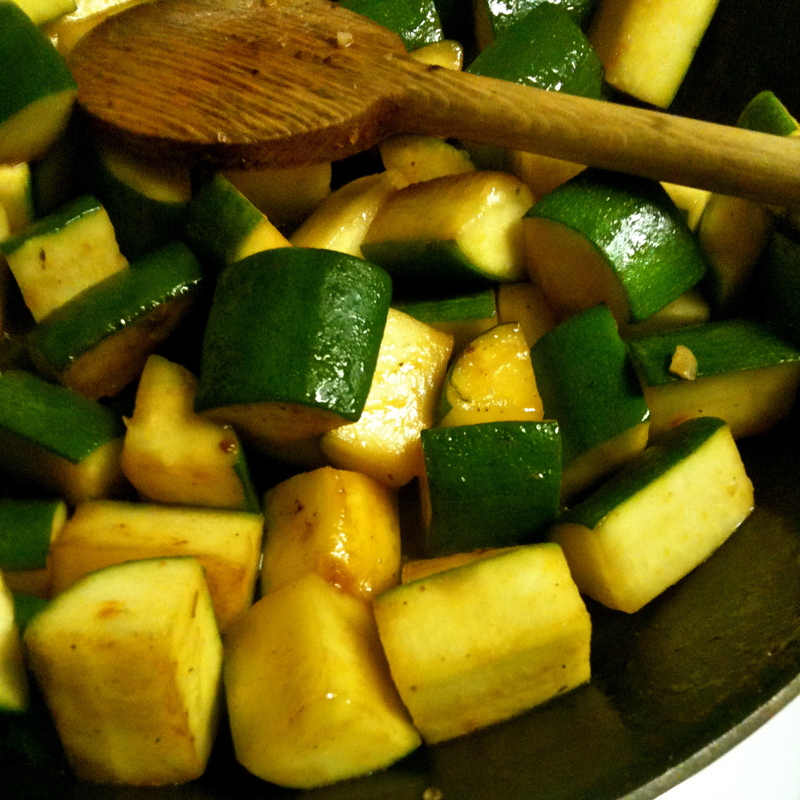 Saute briskly until the zucchini is golden and beginning to soften, about 6-8 minutes. Dump the contents of the skillet into the baking dish with the tomatoes. Wipe out the pan, heat another tablespoon of oil, and saute the peppers for about 5 minutes, letting them color just a little, then add them to the baking dish. 5. Pat the eggplant dry with paper towels. 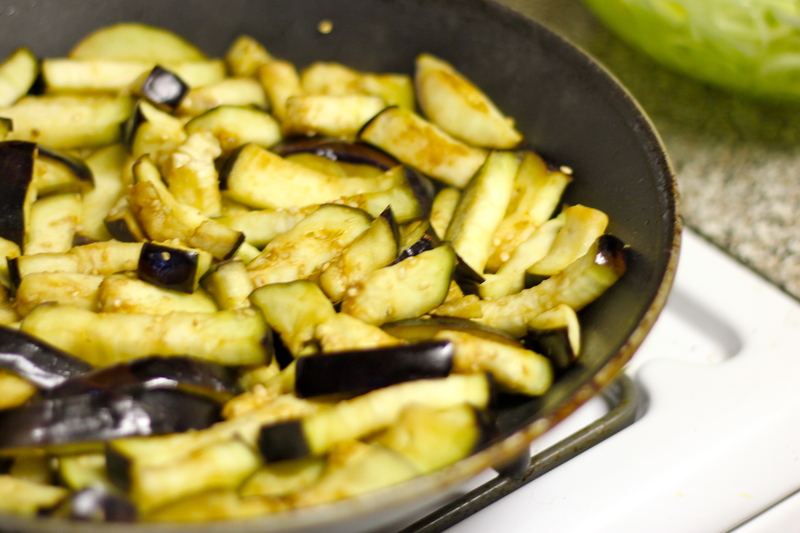 Heat two or three tablespoons of olive oil in the skillet over medium heat and add the eggplant. Cook it until it is nicely browned and softened, about 10 minutes. Season with salt and pepper to taste and add to the baking dish. 6. Add the fresh basil to the dish and toss everything together, gently. Cover with foil and pop into the oven. After 20 minutes, remove the foil and continue cooking the vegetables until they are completely tender, about 1 hour in all. 7. 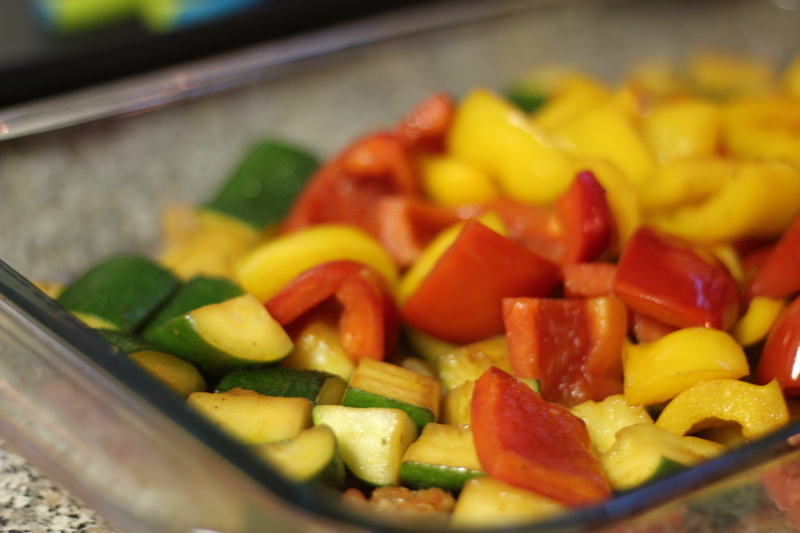 Serve the ratatouille warm, at room temperature, or chilled (cover it if you chill it). Have small dishes of fresh basil, feta cheese, capers, and lemon wedges on the table for your guests to help themselves. Drizzle olive oil over the top of the dish and serve with crusty bread and brown rice. My grandma puts a plate over top of the cut up eggplants, and then puts a big can of veggies or whatever on top of the plate to help push the liquid out of them. You should try pickling eggplant sometime if you never have. That on some crusty Italian bread sprinkled with some parmesan is absolute heaven. Ok, THIS is a great recipe. It is cooling on the counter as I write. 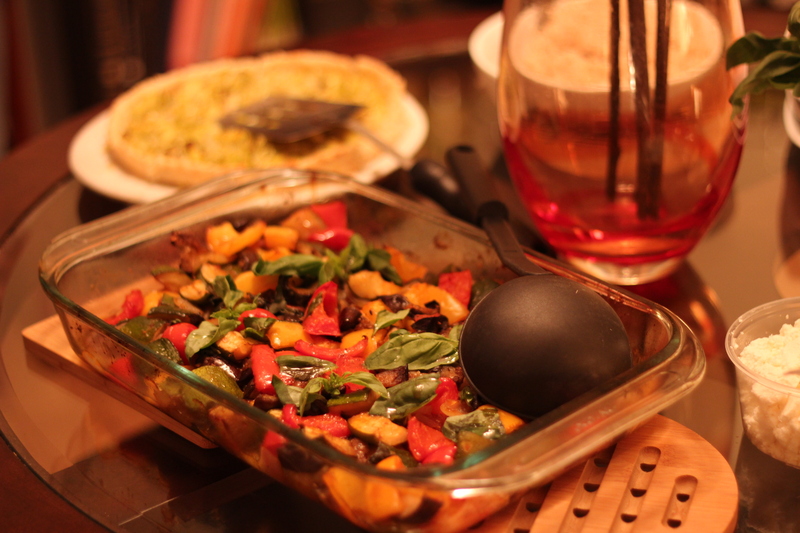 Ratatouille is something that I never looked forward to showing up on the dinner table (Gigo was a really good cook, but Ratatouille was not her best dish). Here is what I did differently. I used 2 pints of grape tomatoes. If you score the vine end in an “x” before you plunge them into the boiling water, the skins will peel right off. I squeezed the seeds out and then left them whole. the size was perfect as is and the taste is far superior than what you can generally find in a large grocery store tomato. Also, I tend to really dislike garlic that spends too much time in the pan, so I always add it in the last 30 seconds to one minute of cooking time. I added it at the end of time the onions were spending in the saute pan so that It would avoid the bitter taste of garlic that has become overdone. Additionally, I left the salt off the eggplant during the saute portion of the recipe. The salt that is added to the eggplant at the beginning is enough. I just added pepper. All in all a wonderful recipe. Nicely done! !